Rather than to repeat my post I would like to ask you to go to Ain’t No Place To Put a Sticker for today. My heart is just breaking from a lesson and reminder that Caden has brought into my thoughts and I wanted to share it with all my readers. 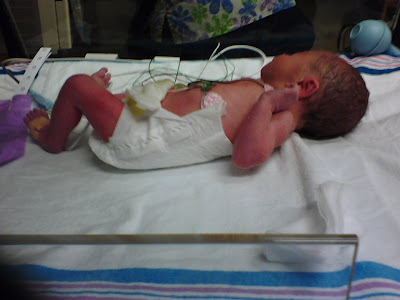 Caden was born about 12:15 PM Saturday, two months early. He weighs 3 lbs 9 ozs. and is 16 inches long. He is doing well and is adorable. For all that has gone on during Misty’s pregnancy you can read about it here and here and here. They have been through a lot and now they have this precious little one. A miracle and blessing from God. We are proud grandparents of 18 grandchildren now! To meet others, check out Beth’s Meet and Greet Monday. Why not join in if you have a blog? We see that little baby born and think he/she is so innocent. How could anybody that tiny and cute ever do wrong? It does not take long before we begin to see that sin nature come out. We wake one morning and our darling is now throwing temper tantrums, slapping, biting etc. I realize that babies bite when they cut teeth or that they can’t express things and it is frustrating, but I am talking about the rebellious times. You say no and they do it and scream at you. For some parents the terrible twos start at 6-8 months old! What are we to do? How much do babies understand? I am always amazed when parents, or many grandparents, think a baby can’t understand or know, and then wonder why they turn into such a hard to manage child. Babies understand more than we give them credit for much of the time. I have some suggestions to help you understand your child and for you to know when your child understands what is being said. From the beginning, talk to your baby. I do not mean “baby talk” I mean really talk. Tell them what you are doing as you are doing it. ( I am making dinner, this is a tomato and I need to cut it) etc. I talked about everything like they were understanding. As long as they were awake in the food store I talked over the shopping, showing them things. I had my granddaughter in the food store when she was about 3 months old and was telling her everything as I walked up and down the isles. One woman was watching me and finally said something to me about how much fun I made shopping for my granddaughter. She had not seen anyone do that before and saw how intent Scout was as I shopped. She is now 13 months old and we shop the same way, but now she knows what I buy and will point to it. Do not talk “baby talk”. They will not learn to express themselves right it we talk wrong. If they get hurt, tell them what happened. “You tripped on the dog” as you are hugging them. If it was something they were not supposed to do, tell them. “We never touch the oven door, it is hot”. Tell them “no” when they do something wrong and be persistent. Remove their hand and say “no” as you are doing it. Say “yes” and “no” to them. It takes little time for them to know the difference, usually a baby will know about the time they begin getting into things! You say “no” remove the offending item and replace it with a “yes” item and they catch on. If you talk to them they will understand words like “shoe”, “head”, “hurt” etc and will be able to in some way express things. They other day my 13 month old granddaughter climbed on the couch (something that is allowed) and then hit her head on the wood between the windows. I did not see this, but she cried loudly as she hit and I ran to her. I hugged her and asked her what had happened. She took her head and put it against the wood between the window and bumped it. I then said “Oh, you klunked your head” and she shook it yes. I then held her and talked to her about the hurt. At13 months she also told me her shoes hurt her. I put on her sneakers and she put her hand on her toes and said “ahhhh soose” The “ah” was a hurt “ahhh”. I took them off and thought her sock must be folded or something, fixed the socks and then put the back on. She complained some more and finally I looked inside and saw her toes were rubbing on the top of the shoe! Pay attention to them. So often we get to talking to our spouse or another child that talks and we do not hear that they are telling us something. It may be good, may be bad and may be a rebellious “no”. What do you do when they persist in the “No no’s” or in tantrums? Tantrums are to be ignored. Much of the time, if right from the beginning, you ignore it they will not last long. Sometimes you get a persistent one that when you leave the room they follow and throw it in the room you are in. Yeah, I had two like that! You just move to another room and continue to ignore it. Two of my daughters would sit on the floor and spread their legs out and bang their head on the floor between their legs. I wanted to laugh at first! It was so funny, but they were persistent and followed us room to room as we ignored them. It stopped and all we did was not give them the attention they were trying to get. The deliberate disobedience of doing something you are telling them “no” about is something different. To handle that it means being firm and being consistent. This is hard if you are like me, sometimes they are so cute or so funny, but it is important that you nip it as a baby. How young is young enough? When you can see that they are disobeying they are young enough for discipline. God expects us to raise our children to be obedient and well behaved. Sin shows up young, very young, yet parents wait too late to start trying to deal with it. Nip it in the bud and it will not flower. One of the hardest things for me is to think of ways I am frugal. I imagine other bloggers have trouble too. Maybe you as a homemaker wonder if you are being frugal or how you can get to be better at it. I like to read ideas and pick something I am not doing and try to start. There are sources out there to help, yahoo groups, other blogs and websites. I believe that as a Christian we are to use our money frugally, use our brains wisely and be creative. Since I was raised in a home where money was tight and then married and had 5 kids on the salary of a small church pastor I had to make do, do without or creatively think of ways to handle the lack of money. I thank God for that background. I found He supplies, He gives creative ideas and life is not dull. When I have a gift to give, I first think of “what can I make?” I look at what I have on hand and then think of what I can do with it. Other times I look for ideas and then see what I have and get the rest. The same goes for decorating and cooking. Too often people think “run out and buy” when the means to save money and have something even better than spending all that money was right in their own home and ability. Frugal living is being creative, thinking before getting out the pocketbook and using what one has first. 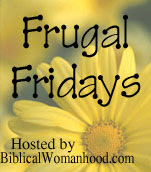 For great frugal ideas hop on over to Biblical Womanhood. It is Wednesday again and as usual Rocks In My Dryer is hosting Works For Me. My post this week is actually because of something my family did for me. As you know from other posts, I live in Texas. My husband and I have three kids and their families here in Texas, but we also have one in NC and 4 more in ME. Three of our 17 grand kids are here, one in NC and 13 in Maine. We miss so much of their lives as we can’t see them very much. This year I was not only given the trip to NC and Maine, but I was also given a thumb drive and one of those credit card size digital photo albums. The thumb drive was bought with the idea that each family would put pictures on it and then I can have the pictures of the kids, trips, landscapes etc of ME and put what I wanted on the small digital one to carry with me and the rest on my computer. They did not get it passed around as they intended, but I did get some great pictures on it from my son. If each family did this for those who are away it would be the best gift they could give. I t keeps those of us that are away feeling we are not missing as much. Kids soccer, T-ball etc. is all there for me to view. This gift is sure something that Works for me!